Alberta’s government is about to evict Canada’s largest community farm and the non-profit’s operator says the New Democrats have shown no interest in sparing the gardens, which supply Calgary’s shelters for women and the homeless with organic produce. The farm, known as Grow Calgary, was started six years ago and now sprawls in the shadow of Canada Olympic Park in the city’s western end. Provincial officials have said that the farm, with its community plots, greenhouses and orchards, needs to be demolished because of the nearby construction of a new ring road. However, the farm’s operator says no highway is planned to go through the farm itself. Paul Hughes, Grow Calgary’s founder, says the provincial government’s offer to move the farm has been halfhearted and incomplete. The province has declined to give the farm a list of possible sites where they could be moved, but has offered to cover $100,000 in moving costs. Mr. Hughes has said Grow Calgary doesn’t want the money, but instead would like to keep the farm where it is. He’s asked to meet with officials to discuss how construction could proceed around the site, but he says those requests have been rejected. The farmers have been ordered off the land by Feb. 4. “They seem hell-bent on getting rid of us,” Mr. Hughes told the Globe and Mail. He admits to being a vocal food activist in Calgary who has not helped his cause by publicly sparring with Premier Rachel Notley’s government. “The thing that hurts is that we put in the effort to grow the soil, we invested in the soil to make it grow. They are going to bulldoze it. They don’t even need it for the road. We’ve kept asking them why they need to do this and they haven’t answered us,” he said. Grow Calgary just isn’t in the right location, according to Alberta Transportation Minister Brian Mason. “We need the space for construction and it’s just not an appropriate place. We’ve offered them financial support to move their operation, but you know, they’re not co-operating,” he said. The minister dismissed Mr. Hughes’s request for the farm to stay where it is. “He’s squatting on provincial land and I don’t think he’s in a position to make a whole bunch of extensive demands,” Mr. Mason told the Globe. The farm has a lease with the government for 11 acres of land in the Transportation Utility Corridor around Calgary, a swath of provincially owned land designated for highway construction. Grow Calgary began operating in 2013 on scrubland on the edge of the corridor, which was designated as surplus to the demands of a future ring road, according to Mr. Hughes. Construction of Calgary’s 101-km ring road is supposed to be completed by 2022. The new highway running near Grow Calgary will be one of the last sections completed in the decades-long project, with construction expected to start in the spring. The farm supplies a number of Calgary’s largest homeless shelters. According to Ann O’Donnell, the Calgary Women’s Emergency Shelter’s resource development director, the impending closure will drive up costs for the 14,000 people who use the shelter’s low-cost food services annually. “We have a rather large food budget that we have to fundraise for and having Grow Calgary provide us with nutritious produce has been incredibly helpful,” said Ms. O’Donnell. The shelter has estimated they save about $200 weekly because of the free produce from Grow Calgary. “They’re doing such good for the community and we need to give them credit for that,” she added. Grow Calgary’s staff had been aware that the farm would eventually be adjacent to a construction site, according to Mr. Hughes. However, he said, the farmers had no inkling of trouble until they received a letter from the deputy minister of Alberta’s infrastructure department on July 5, 2018. The letter, shared with the Globe, thanked the farm for providing fresh produce to social agencies in Calgary, but gave them until the end of the year to leave – a deadline since extended to early February. “There are limited parcels of land in Calgary’s Transportation Utility Corridor that could be used to relocate Grow Calgary, should you be interested,” stated the letter. The farmers then scouted the corridor and proposed 15 sites to the government. All were rejected. Instead, Alberta officials took Grow Calgary staff to one location on the outskirts of Calgary. They were told they had to reject the site before they would be shown a second location, said Mr. Hughes. A request for a list of sites, which the farmers could study, was rejected, he said. Alberta Infrastructure declined to comment on the process described by Mr. Hughes and provided the Globe with a statement. “From what we know about Grow Calgary’s operations, this site was the best option available for them to continue their work. If Mr. Hughes has certain criteria for lands that would better suit Grow Calgary, we are happy to have a conversation about further options,” wrote spokeswoman Jennifer Burgess. Mr. Hughes said his requests to work with the government have been largely ignored. After months of promises from a number of different officials, he said he no longer has any trust in the province to help. Calgary councillor Gian-Carlo Carra said he supports the farm and the work it has done training thousands of volunteers to grow their own food. 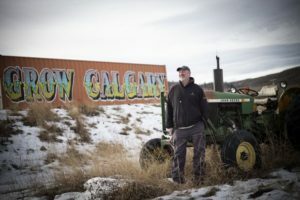 There’s a lot of vacant public land in Calgary’s expanse that could be put under cultivation and he said he has been willing to help Grow Calgary find new land to farm. “The beautiful thing is that they don’t need to be anywhere specific, there are all kinds of places they can go. I hope they continue their work on suitable land that is not a construction staging ground for a giant ring road,” he said.